Scottish photographer Thomas Annan's study of poor housing conditions in the back streets of Glasgow. 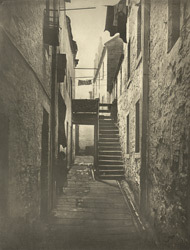 Annan was commissioned by The City Improvement Trust to document the city's slums which were scheduled for demolition and reconstruction through an act of Parliament in 1866. Buildings in Saltmarket were "...given over to the housing of the 'industrious poor', or to those who made their livings in the streets, in one way or another." Extract from Anita Ventura Mozley's introduction to the Dover Edition of 'Old Closes And Streets Of Glasgow'.